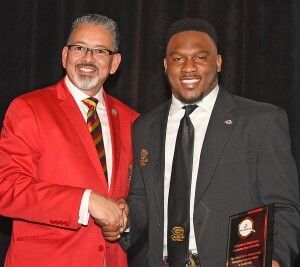 Grambling State University senior linebacker De’Arius Christmas received one of two United States Marine Corps Excellence in Leadership Awards during Friday’s Bayou Classic Coaches Luncheon at the Hyatt Regency. Southern’s Jaron Johnson received the other award. Before the big battle on the field on Saturday, Grambling State and Southern football teams, administrators and supporters gathered for the 45th Annual Bayou Classic Coaches’ Luncheon. The leadership awards recognize players that display some of the same qualities of the Marine Corps: integrity, decisiveness and dependability. Christmas, who is a National Football Foundation (NFF) William V. Campbell Trophy and STATS FCS Buck Buchanan Defensive Player of the Year Finalist, personifies the scholar-athlete ideal, leading Grambling State in tackles while working toward an engineering degree. The Vicksburg, Miss., native deservedly becomes the Tigers’ second NFF National Scholar-Athlete, and their first since 1972. Boasting a 3.82 GPA as an engineering technology major, Christmas is on pace to graduate in May 2019 and aspires to work at his hometown’s research and development laboratory. The SWAC All-Academic Team selection was named the 2017 Grambling State Student-Athlete of the Year across all sports. His other academic accolades include the Athletics Director’s Academic Honor Roll, the President’s List and the Dean’s List. For the second consecutive season, Christmas is the Tigers’ leading tackler, posting 42 stops in 2018 along with 8.5 tackles for loss and 3.5 sacks. He has twice been named the SWAC Defensive Player of the Week this season, including his performance against Alabama State where he returned an interception 66 yards for a touchdown. Christmas’s other weekly honor came when he led Grambling State with eight tackles while recording two sacks and an interception in a win over Texas Southern. A two-year team captain, Christmas, who is the son of Tina Qualls and Derrick Christmas, led Grambling State with 88 tackles in 2017 en route to earning Third Team All-America status. The 2017 SWAC Defensive Player of the Year also garnered first team all-conference recognition while guiding the Tigers to consecutive 11-win seasons and SWAC titles. Christmas led Grambling State to a victory in the 2016 Celebration Bowl, which denotes the HBCU national champion, and he guided the Tigers to an appearance in the 2017 edition. This entry was posted in Uncategorized on November 24, 2018 by Jovan Hackley.